Still on the Foot Truck episode with Polish journalists Lukasz Wisniowski and Kuba Polkowski is another cracker coming in. In our previous publications, we revealed what Wojciech Szczesny had to say about some of his ex-colleagues. The Polish goalkeeper made some assessment and at the end concluded on the character of some former Arsenal players. He highlighted arrogance as one of the traits in Robin van Persie while also stating that his best friend Jack Wilshere was seen lying drunk in the bush at his wedding. 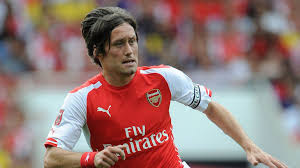 In this one, he has taken shots at Tomas Rosicky who according to him 'never spends any money' except on his guitar. "You watched him play with great pleasure, the Little Mozart; his movement on the pitch was impressive, full of class and grace. I still believe he's the richest footballer I know. "He never spent any money. The whole time I was at Arsenal he had the same car, a 2005/06 Mercedes, and wore only clothes from his sponsor. The only thing he didn't spare on was his guitar." It's been a very interesting one from the Juventus goalkeeper so far. He has given us reasons to laugh and keep ourselves busy in the absence of club football action. Szczesny signed for the Serie giants following a two-season loan spell at Roma. He was part of the side that overturned a 2-0 victory by defeating Atletico Madrid in the Champions League. They will now face Ajax Amsterdam in the quarter-final of the competition later in April.